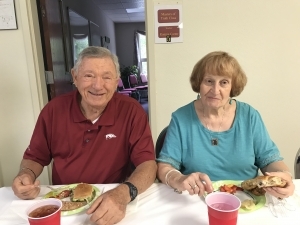 After a sermon series about “Reaping from the Past; Sowing for the Future”, the church enjoyed an evening of fellowship on Sunday, September 30, 2018 from 5:00 to 6:30 during which we ate together and celebrated our church’s history. Honored that night were 14 of the charter members who were each in some way involved with history-in-the-making. They were Martin and Lenore Brink, Turk and Betty Davis, Beth (Fore) Garton, Burl and Judy Holmes, Bob and Anne Mathis, Harrison and June Pike, Harry and Judy Rector, and Nadine (Wilkinson) Garton. After a light meal, we listened with awe to stories from each of the charter members as they re-capped for everyone what it was like building and opening Village Baptist Church. 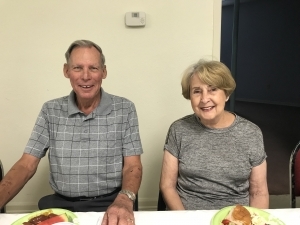 Plans for the church began with open discussions in October of 1996 while they were still members of Bella Vista Baptist Church on the East side of Bella Vista (BV). 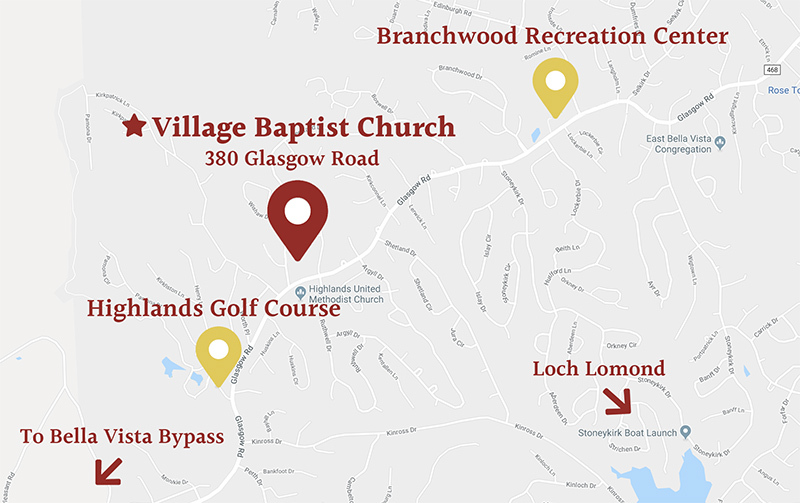 After much prayer, the Mission’s Committee of that church decided to start a new mission: building a church on the West side of BV in the Highlands. 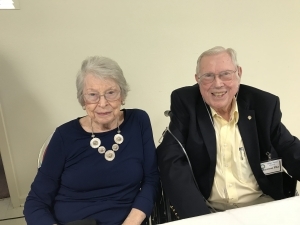 Initially there were 53 people who were involved with the Mission Project and they began by meeting in homes and later meeting in a rented suite in Wood Lin Center. A Ground Breaking Service was held on March 21, 1999 where the current church stands today. 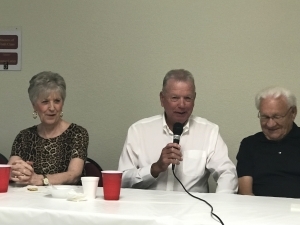 The evening’s discussion began with Harrison telling us that he initially went to talk to the Pastor at BV Baptist Church about the idea of building a church on the West side of BV. Harision was determined to make it happen and he was committed to go forward. He reminded us that we must always have “stickability” when we are determined to do something for the Lord. His wife, June, added that we must be committed to the Lord and His work. Beth shared about the teams that were formed to accomplish various tasks and how they kept a Prayer Journal throughout the journey. She added, they were determined to be a “Beacon for God.” Nothing was done without prayer first! Bob talked about the teams of people who came from “Builders for Christ” to help build the church. He said this group saved them almost $1,000,000 with five weeks of free labor. Bob remembered that they saw many miracles happen during this building project: like the day the work came to a standstill because they needed steel workers. Shortly after noon two steel workers showed up on the scene! “It had to have been God,” Bob said. He reminded us that if we have faith, God will provide. We need to listen to His dream and then work with Him to make it happen. 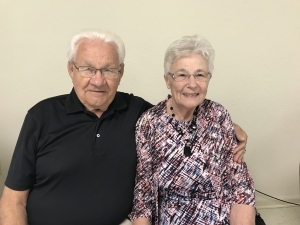 Anne, Bob’s wife, commented that they had unity among the group building the church and that is what a church must have, plus love for one another. She remarked that behind the walls of our church are many crosses that were drawn on the wood framework. Betty Davis remembered how she worked in the nursery. She reminded us of the importance of being faithful in serving. Her husband Turk, spoke about how they had just come from Shreveport, LA in ’96 and attended BV Baptist Church. When they heard about the project of building a church on the West side, they decided to join in with them. The Davis’ showed us the importance of commitment. Lenore spoke about how God answered prayers to build His church. She said how thankful they are that we were then and still are known as a “praying church”. Lenore discussed how wonderful Christian fellowship is. Burl reminded us about the importance of stewardship. Throughout the building project, people were faithful and gave sacrificially to make the church a reality. He told all of us how important it is to remain faithful to God in our giving. 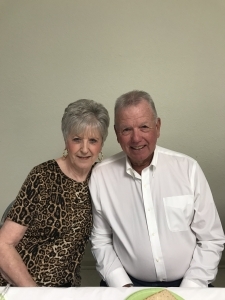 His wife, Judy, spoke about how our church has always been a church built on the Bible and that our future remains in the hands of those who will preach the Word of God. Judy Rector reminisced about their first meeting in homes and then the strip mall. We laughed with her as she recalled teaching children’s classes in the Beauty Shop. The children loved it! 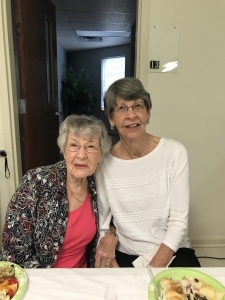 She recalled that on the boards behind the walls of our church, many wrote their favorite Scripture verses while they were building the church’s frame. Those verses are literally holding our church together! 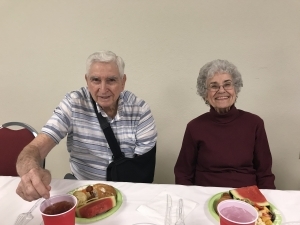 Harry, Judy’s husband, said they opened the church without the lower level being done; it involved a great deal of finishing work. Among other things, Karleen reminded us, that Nadine painted murals on several of the classroom walls. Harry said that the charter members were God’s seeds that He planted; then the Holy Spirit made things grow into what we have today. Harry said the Holy Spirit is very alive in our church today and that is our future! Those of us who are newer members of the church learned a great deal that night and we walked away from the celebration proud to be part of a praying congregation who exhibited unity along with great faith, as we witnessed the continued work of the Holy Spirit in our church throughout the years. God bless Village Baptist Church and all the many people who have worked together with the Lord to make the church what it is today! May we continue on the path that these faithful folks began in 1996. Praise be to God!